Norman's early aspirations as the Green Goblin involved uniting the criminal underworld under his sole command. As his preoccupation with Spider-Man grew, he placed less focus on his rule over a vast criminal empire. But Norman's involvement with the society's illegitimate members never ceased, despite his newfound "clean" image. 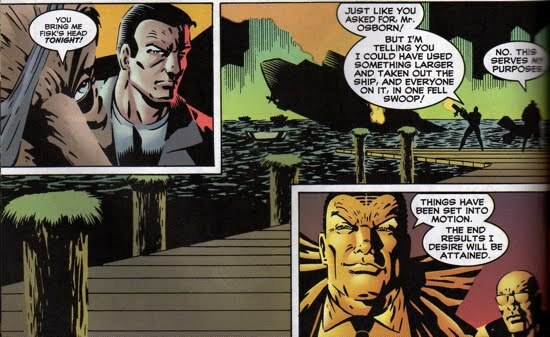 When the Kingpin returned to New York City, Osborn is viewed as an obstacle to Fisk's resurgence to the Kingpin of crime. Osborn has only a small role in this story, but his actions are in no part minor. Norman is staunchly against Kingpin's return, and in an effort to muddy the waters for the mob bosses, Norman secretly attacks the group. 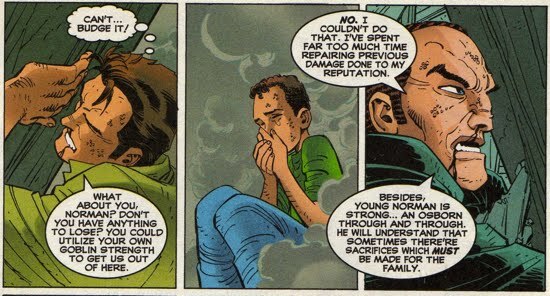 During a truce meeting between Silvermane, Hammerhead, and the Rose held by Fortunato on his yacht, Osborn uses a rocket launcher to sink the boat. As the boat is sinking, Norman mysteriously claims “the end results [he] desires will be attained”. No doubt this was done to serve his own interests, but the exact nature of Norman's plan is not revealed. The story ends with the Kingpin and Norman in an uneasy truce, but as we shall soon see, their cease fire does not last long. 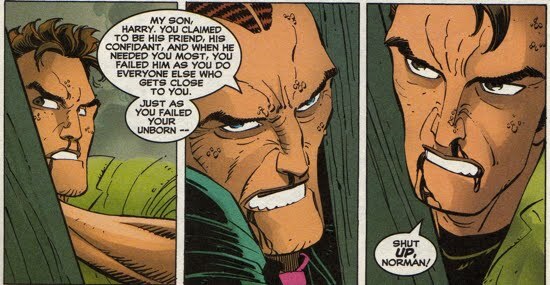 The Kingpin soon takes a retaliatory shot at Osborn in Peter Parker Spider-Man #95. The Kingpin sends the assassin Nitro to kill Norman at the Daily Bugle building. 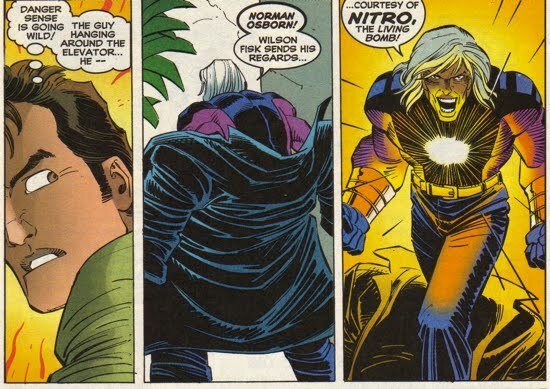 Unfortunately Norman isn't the only person who feels the wrath of Nitro's assassination attempt; Peter, Betty Brant and Normie Osborn are in the vicinity when Nitro "explodes". 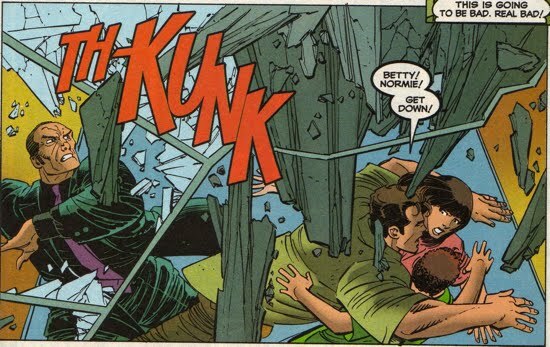 After Nitro Detonates himself, Norman, Peter, Normie, and Betty Brant become trapped in the destroyed elevator remains. After a some pyschological provoking by Norman, Peter decides to save Betty and Normie at the risk of revealing his identity to the public by displaying superhuman strength. After saving Betty and Normie, Peter goes back and saves Norman in the nick of time. 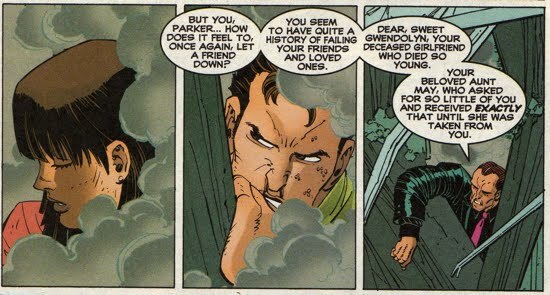 A decision Peter may have wished not to make, for Norman would soon return to the role of the Green Goblin to terrorize Peter and those close to him. The Kingpin continues to take shots at various other mob bosses including Fortunato, Silvermane, and Hammerhead as he pursues his goal as the Kingpin of crime.